As Canadians, we are aware of a certain amount of risk when participating in recreational activities and even when driving on congested Ontario roads. Many of us counteract the risk by adopting safe practices such as swimming with a buddy, skiing or snowmobiling on designated trails, and defensive driving practices. However, few people expect to encounter a dangerous and even, life-threatening situation when shopping at a mall. Thus, Canadians were shocked when a mall in Elliott Lake Ontario collapsed, resulting in injuries and death to residents of this community. 19 people were injured and tragically, 2 died when large portions of the Elliott Lake mall collapsed, allegedly due to a defective design, inadequate maintenance and inferior professional oversight. In an investigative report delivered 2 years after the collapse, it was concluded that many of the professionals responsible for mall construction, maintenance and inspection, including builders, architects, engineers and public officials, failed in their duty to protect the public. The City of Elliot Lake, the mall president and treasurer (Robert Nazarian), Eastwood Mall Inc., the Ontario Ministry of Labour and the engineering firm M.R. Wright and Associates were named defendants in a lawsuit for damages exceeding $11 Million. Five additional defendants, including the original mall developer and 2 mayors, were added to the suit in response to information that was learned in the Elliott Lake inquiry two years after the collapse. The lawsuit was filed by the families of Doloris Perizzolo and Lucie Aylwin, who were killed when the roof of the Algo Centre Mall's parking area collapsed. Further, although Perizzolo’s death occurred quickly, there is some evidence that Aylwin may have been alive for almost 40 hours trapped beneath the debris. The defendants were allegedly aware of the mall's issues but did nothing about it, meaning it was through their negligence that lives were put at risk. In this wrongful death suit, the Aylwin and Perizzolo families are both seeking damages for ‘loss of care, and guidance and companionship’ resulting from the deaths of Lucie Aylwin and Doloris Perizzolo, for $750,000 and $500,000, respectively. They are also asking for $6 million and $4 million, respectively, for punitive and aggravated damages (combined). In addition to a determination of negligence resulting in death on the part of the defendants, the judge will further decide if the compensation amount named in the suit is merited by the losses. Before any personal injury lawsuit can go to trial, whether involving many parties such as the Elliott Lake disaster or only 1 defendant and 1 plaintiff, there are many steps that first need to be taken. Every lawsuit differs as to the kind of injuries incurred, the source or reason for the injury, and the severity of the consequences to the injured person(s). A consideration of how much the injuries have changed the life of the victim, with respect to their ability to perform regular activities (specific to the individual) and work functions, plays a large part in determining the amount of damages. In the case of wrongful death, it is the losses for the victim’s family, and particularly, the dependents of the victim that are assessed. The first priority following an accident is for the injured person to seek medical treatment. Early medical care will often prevent injuries from becoming more serious. Accident victims should demonstrate that they are doing their best to get well, such as following their doctor’s advice. Anyone seeking damages for injury has the duty to mitigate his or her damages. This means that the injured person must do what is reasonable to minimize the financial damage resulting from the accident. Clearly, if an accident victim leaves a fracture untreated, the injury will worsen and it will become even more difficult for the individual to fulfill their day to day activities, and in fact, they may not heal properly as a result. In Ontario, this behaviour may be deemed contributory negligence because the patient’s actions contributed to the loss. Further, individuals who claim that they were injured but have not sought medical treatment may not be believed when making a claim. Medical reports from doctors and other health care professionals provide important input on your claim for compensation. Accident victims should keep receipts and detailed records of medical care and expenses, to ensure that they are fully compensated. Your second priority as an accident victim is to engage an experienced personal injury lawyer. Sometimes, if it is just a small claim, it is understandable that you may want to handle it yourself. However, there is always a chance that you might not get what you are fully entitled to. Accident victims with legal representation typically receive more compensation. Your personal injury lawyer will want to know all the details of the accident, the nature of your injuries as well as any medical treatments that arose from your injuries. It is wise to obtain as much information as you can from any accident witnesses, as well as details from the other parties involved in the accident. This includes full name and address, name of their insurer, and any physical evidence that will help communicate your case. Your details about the incident will help your lawyer determine whether negligence was likely the cause of the accident, whether you have a chance at making a successful claim and in assessing probable compensation for you. The vast majority of personal injury claims are settled out of court. This is particularly advantageous for small claims as the costs and time requirements for a trial are significantly higher when the case goes to trial. It is unwise to agree to a fast settlement; sometimes injuries worsen and the impact on your job, family life and other activities is much greater than was initially thought. To be able to assess the full value of a personal injury case, the victim must have already fully recovered. The healing process takes time, often years. Yet, it is clearly unreasonable to ask victims to indefinitely forgo funding for expenses arising from the accident or their injuries. Your personal injury lawyer understands the ideal timeframe within which a claim for damages should be made, where there is solid information about the extent of the victim’s injuries so that full damages can be sought. In Sault Ste. Marie, the Injury Lawyers of Ontario (ILO) law team has vast expertise in the field of personal injury law. We will explain to you all aspects of your case so that you can make an informed decision. ILO lawyers want to involve you in the key decisions for your claim. 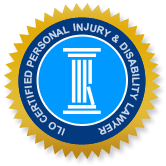 Whether your injury was the result of a motor vehicle accident, slip and fall, recreational accident or any other incident, the ILO law team in Sault Ste. Marie will do whatever is necessary to achieve maximum compensation for you.